The decision to find a personal trainer can be life changing. A good personal trainer will help transform your body, as well as boost your endurance and energy levels. Getting fit can also provide a much needed lift to your self-esteem and confidence, which could help to transform your life in many ways — and don’t feel that working with a personal trainer should be considered as the luxury it once was. People from all walks of life — and with a variety of different needs and goals — are realizing the impact that improving their fitness can have on their lives. This is reflected in figures from the Bureau of Labor Statistics, who predict that the number of personal trainers and fitness instructors is set to surge by 31.7% by 2020, and the demand for fitness professionals is likely to grow as more people realize the importance of improving their health and the benefits of finding a personal trainer. The most important benefit is the motivation working alongside an experienced personal trainer will provide. Many people give up exercising after a while as they simply lack the motivation to exercise on their own, and while working out with a friend might be helpful, they won’t know how to help you push past the emotional and mental blocks that can stand in the way of your progress. You’ll also gain a lot from learning the proper form. People often adopt poor habits when they work out regularly —especially if they workout alongside others who don’t know how to perform an exercise properly. This can result in you not getting what you want from an exercise program — and you won’t be able to see where you’re going wrong. By learning proper form, you’re also reducing the risk of injury. Also, you’re more likely to see the results you want if you work with a personal trainer who can customize their services to meet your needs. If you’re like most people, you’ll have areas of your body you want to improve, but you might not know the best way to get there — and the exercises that work for someone else, won’t necessary work for you. Professional trainers know what it takes to see results and get you the body that you want! It is important to be realistic about what you can afford and whether you can commit to a personal training program on a recurring basis for at least 3 to 4 weeks in order to see the best results. The next stage should be to check that you are medically fit. This is especially important if you have joint problems, diabetes, asthma or if you’re recovering from cancer or undergoing treatment. If you have any other symptoms that might indicate a problem with your respiratory system or heart such as feeling lightheaded, breathlessness or swelling in your lower limbs, it’s imperative you see a doctor first. Likewise, if you have heart or kidney disease or any other health concern, speak to your doctor before pursuing your plans. Finding a personal trainer isn’t a decision you should rush: you need to find a team you can work with long-term, if you’re going to build trust with them and see better results. Begin by speaking to friends, family or colleagues and ask them if they have a recommendation for somebody local. To continue your search, look online to see what other people are saying about personal trainers in your area. By the time you have completed your research, you should have a good idea of what each one offers and you should have been able to narrow down your search. 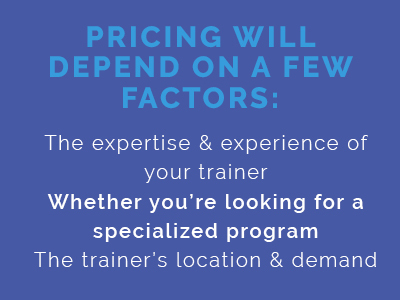 However, don’t just limit yourself to local trainers — you might have to look/travel farther afield to find a personal trainer you feel you can work with. With a list of possibilities, now you need to establish just how good the personal trainer is. Looking at testimonials from satisfied clients is always a good starting point, and some sites put up ‘before’ and ‘after’ pictures so you can see the potential results of working with a good personal trainer for yourself. Their website is also a great place to find out more about background, qualifications, awards and their personal approach to training. Before committing to regular sessions, you’ll meet your personal trainer for an initial consultation or assessment. This is a great opportunity to assess whether you think you can work with them for an ongoing period. However, don’t feel you have to go with the first person you find — try some training sessions with a number of personal trainers until you find one you’re confident you can work with long term. Is the environment too crowded? If it is, this could limit your access to equipment. What is the overall atmosphere like? Make sure you’ll feel comfortable working out in the setting. Are the staff helpful and friendly? They should be accommodating and eager to answer your questions. Does the personal trainer look professional? Do they communicate well with you during your initial conversation? What is their teaching style like? Do you want to work with a trainer who is quietly encouraging or more upbeat? Their style has to meet yours, or you might not work well together long term. Monitor their attention levels as you talk to them. Are they interested purely in you as a potential client, or is their attention easily drawn to other distractions? Staying motivated will be one of the key factors that keep you going back to the fitness center. Is your personal trainer the type of person who makes you feel good? Do they offer encouragement when you need it? If so, they will likely be the motivating factor that will help you meet your fitness goals. When you have the opportunity to ask questions, assess whether or not they listen to your concerns and how they address them. If you don’t feel comfortable talking to them, it could be a sign that the personal trainer isn’t right for you. What is their background in fitness? How long have they been involved in the industry? What type of clients do they usually work with? What qualifications and certifications they have? In the United States, personal trainers need to have a certification that has been approved by the NCCA. Do they have a specialization, or do they cover a broad spectrum? What are the terms and conditions? Make sure you understand cancellation policies, notice periods and payment options and anything else that could influence your membership. Is the personal trainer constantly learning? New workout techniques that offer better results become mainstream all the time. Ask them if they keep up with new developments, research and trends so they can offer you the latest and most effective exercise ideas. Don’t forget to check their availability. Do they have enough available timeslots to meet your needs? If you’re working with a personal trainer, you’ll want to meet with them on a regular basis to see the best results, and their availability will have to match your personal needs. How do they manage injury time or illness? If you need to adapt your workout regimen because of a minor illness or an unexpected injury, will they cater for you? How does your personal trainer track your progress? You’ll want to know how well you’re progressing — it’s a real motivator. Do they understand your goals? Are they aware of any health problems and how willing are they to modify your workouts? Can they help you help reshape your attitude and give you nutritional advice? And what are the warning signs that a particular person trainer might not befor you? The program he or she designs for you should be tailored to your specific needs and what you want to gain from your new fitness regimen. 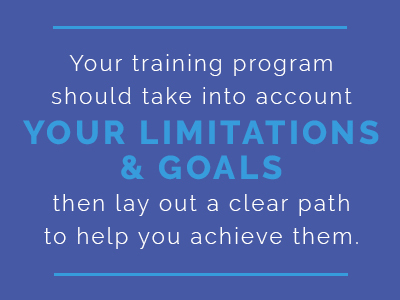 It will also need to take into account any of your limitations as well as your goals, and then lay out a clear path to help you achieve them. Be specific with your trainer and explain what you want to achieve. Do you want to gain strength, or lose weight? Is your goal to improve sports conditioning or to rehabilitate? Knowing your personal goals before looking for a personal trainer makes it easier to find the one who can help you the most. In order to design the best plan for your specific goals, your trainer will also need to be aware of any injuries, muscular/joint pains or medical conditions and consider how these might affect your workout program. For instance, if you have a problem with your knees or back, then you could find squats difficult. Alternatively, you might also have health issues that could benefit from a particular form of exercise. As an example, people with back pain can often see an improvement by strengthening their core muscles — a trainer can tailor a program so it addresses those specific problems. By being honest and open about any health problems, your trainer will not only be able work within your limitations, but they could also help you to find ways of improving the way you manage your condition. If you are looking to change your shape or lifestyle, it will require a long-term commitment to diet, exercise and your well-being in general, however, this commitment isn’t possible if you don’t have the right attitude. Working with a fitness professional can go a long way towards changing your mindset, which will help you to stay motivated and stick with your plan. When you meet the personal trainer for the first time you’ll have to evaluate their general attitude and see if you feel they are the person who can motivate you to make the lifestyle changes that are necessary if you’ll going to transform your body. Don’t underestimate the power of good nutritional advice. A good diet and the right nutrients are essential to allow your body to repair itself after workouts, and to help provide your body with the correct fuel it needs — don’t overlook this aspect of your fitness regimen. Establish whether your personal trainer can offer the dietary advice that will complement your exercise program or if they can connect you with a dietitian. You can tell a lot about a trainer by the language they use. For instance, the “no pain, no gain” mantra was famous in the eighties, but times have changed. Responsible fitness experts realize how damaging that kind of approach can be, and while you can expect to feel challenged during a workout they won’t push you farther than they feel you can go. During your trial sessions, be cautious of trainers who don’t offer detailed explanations on how to safely exercise and who don’t seem to listen to your worries. Be wary of trainers who offer medical advice. If you have a medical concern, their first action should be to advise you to see a doctor, rather than offering alternative advice or remedies that might be unsuitable. After reading this article you should know all you need to about how to find a personal trainer. You’ll also know the right questions to ask and how to spot the signs that a trainer is or isn’t a good match for you. way you look and feel! Learn more about finding the right personal trainer at Jemma Everyday, an EIF partner that provides women with resources to help them better their every day lives.